Over the course of more than 20 performances this work has evolved building the performance/instrument/composition, developing code, physical instruments, sonic textures and a movement language step by step. 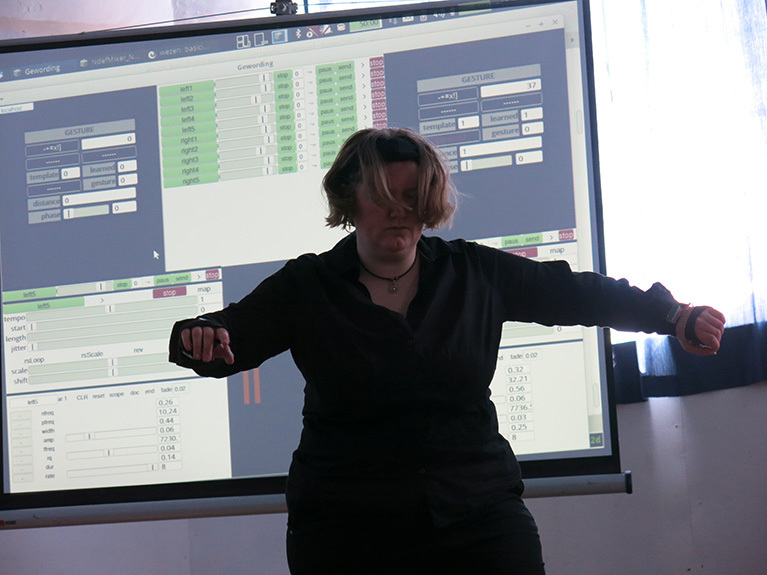 By giving equal importance to the physical movement as a theatrical event and the transparancy of the process of building up the code and processes that connect the movement to sound, the work puts into question where the boundaries between composition, instrument building and performance lie as well as whether there is a boundary between the body and the music. Wezen - Gewording (video from 2018) from Marije Baalman on Vimeo. Wezen-Gewording (video from 2013) from Marije Baalman on Vimeo. Wezen-Gewording, live at Lydgalleriet, Ostre, Bergen, Norway from Marije Baalman on Vimeo.